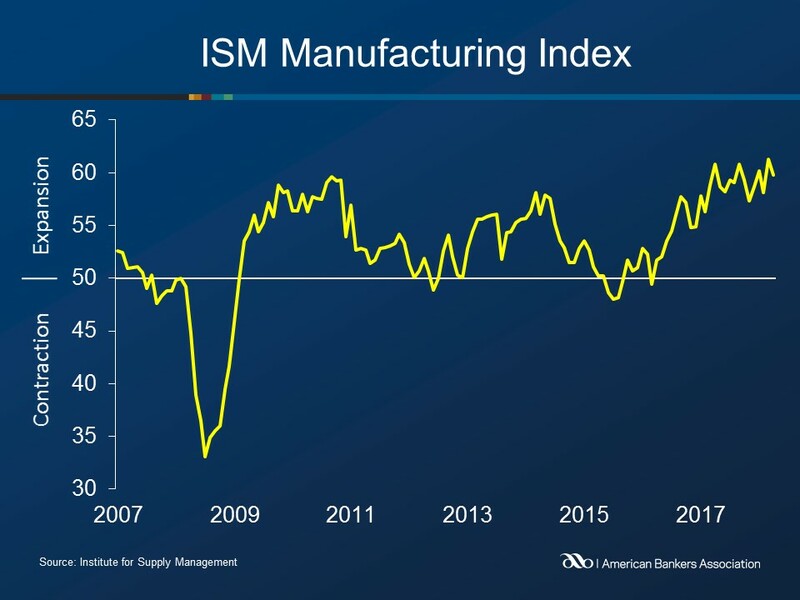 The ISM Manufacturing Index registered 59.8 points in September, down 1.5 percentage points from the previous month, according to the Institute for Supply Management. September’s reading indicates the twenty-fifth consecutive month of expansion in manufacturing, as readings over 50 points denote expansion. Of the eighteen manufacturing industries, fifteen reported growth, while one reported contraction. Nine of the ten index components grew, while the supplier deliveries index slowed. The Employment Index increased 0.3 point to 58.8 in September, indicating expansion for the twenty-fourth consecutive month. Twelve industries reported expansion, while three reported a decrease in employment. The New Orders Index decreased 3.3 points to 61.8 in September, indicating growth for the thirty-third consecutive month. Twelve industries reported expansion, while three reported a decrease in employment. Export orders increased 0.8 point to 56.0, indicating growth for the thirty-first consecutive month. Five industries reported growth while three reported a decrease in new export orders. The Inventories Index registered 53.3 points, down 2.1 points from the previous month. Eleven industries reported higher inventories, while three reported a decrease.